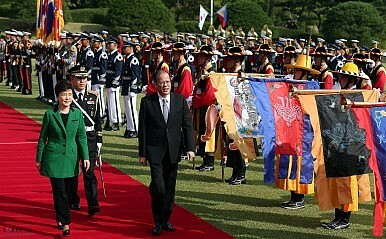 South Korean president Park Geun-hye and Philippine president Benigno Aquino jointly inspect the honor guard in the latter's visit to Seoul in October 2013. The delivery marks small but significant step in military modernization efforts. The Philippines received the first two of a dozen new fighter jets from South Korea over the weekend in a notable development in the Southeast Asian nation’s effort to modernize its underfunded military. The jets, which touched down at Clark Air Base on Saturday morning, were the first to arrive of 12 FA-50 Golden Eagle jet fighters that the Philippines had acquired from Korean Aerospace Inc. for 18.9 billion pesos ($402 million) last year (See: “South Korea, Philippines Deepen Military Ties”). That deal is part of an ongoing military modernization program, which has taken off under President Benigno Aquino III (whose tenure expires next year). The arrival of the jets is significant as it marks the first time that Manila has had a supersonic capability since it decommissioned its Northrop F-5 “Tiger” jet fighters back in 2005 due to the lack of spare parts. “We’re glad were finally back to the supersonic age,” Philippine Defense Secretary Voltaire Gazmin said. Supersonic refers to having aircraft capable of flying faster than sound, or 750 miles per hour. The FA-50s, which can carry two pilots, have a top speed of Mach 1.5 or one and a half times the speed of sound. They can be fitted with air-to-air missiles, including the AIM-9 “Sidewinder” air-to-air and heat-seeking missiles apart from light automatic weapons. The altitude limit is 14,600 meters (48,000 feet) and the airframe is designed to last 8,000 hours of service. The jets are intended to help the country address a range of internal and external threats, including growing Chinese assertiveness in the South China Sea (See: “The Truth About Philippine Military Modernization and the China Threat”). While the arrival of the jets – which was delayed slightly due to inclement weather – is no doubt historic, it is still just a small step in efforts to improve the country’s military capabilities. The jets are still unarmed, and Philippine defense officials have said that getting them combat-ready will require around two or three years. The FA-50s will also have to undergo technical inspections and acceptance flights before being officially turned over to the Philippine Air Force (PAF). And in any case, Philippine officials have already said that the FA-50 – technically classified as a light combat aircraft – will only act as the country’s “interim fighter” until Manila gets both enough familiarity with operating such jets and additional funding that will pave the way for the acquisition of more capable fighter aircraft. The longer term goal is to develop a full combat wing by 2028. The remaining FA-50s are expected to be delivered through 2017. Manila is moving forward with purchasing ammunition for its new jets from South Korea.